One of the most important things that a pizza shop owner is going to have to do when first opening a shop is to decide which type of pizza oven to purchase. One of the things that you will find is that just about everyone who makes pizza for a living has his or her own opinion when it comes to choosing the right pizza oven. This makes sense as everyone has a different idea of what makes a perfect pizza. Rather than telling you which pizza oven you must choose, it makes more sense to look at the various types of pizza ovens available so you can determine which style is going to be the best choice for your particular business. A pizza deck oven features hearth decks on which you will be cooking your pizzas.These ovens use burners to heat the stone that cooks the pizza, producing crispy crusts that customers love.Several reasons why pizza shop owners like this type of oven is because of its similarities to a wood-fired pizza oven and it's lower cost. This oven is a great choice for many pizza shops that want to have an authenic pizza with an old-world taste. These types of ovens require skilled operators who will be constantly monitoring the pizzas. The brick pizza oven is a pizza shop classic and many owners would never choose anything else. They feature a dome and a hearth and provide a true “old school” way of cooking pizza. Most of the brick ovens that you will find are wood fired. However, you can find some gas and coal brick ovens as well. The brick pizza oven has a high heat density and as a result cooks pizzas very quickly. These ovens also produce a crust that is crispy, yet soft and chewy, and toppings that are crispy as well. A final benefit of a brick oven is that they impart a unique flavor to the pizza, one that is hard to replicate. 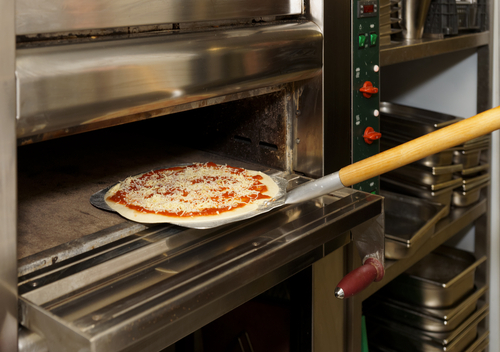 Many pizza shops are looking for ways to save money, and using a convection oven is one of those ways. Convection ovens use less energy when compared with other types of ovens, and they also require less skill on the part of the operator. They also cook pizza more quickly than deck or brick ovens and can easily be used to cook other foods as well. The resulting pizzas come out tasty, thereby making this type of oven a good choice for those who have limited space or want to save money on electricity. The conveyor ovenuses a conveyor belt to bake pizzas. Although this process takes longer a conveyor oven can be a good option as it offers more cooking options than just pizza. A worker can place the prepared pizzas on the conveyor belt and perform other tasks, while the pizza basically cooks itself.A conveyor oven can also be used in pizza shops to bake cookies or make toasted sandwiches. These can be good for pizza restaurants that specialize in other foods besides pizza. A final note. Be sure to take the time and research the various pizza oven options available and choose the one that best fits your pizza making requirements. Keep in mind the amount of pizzas you expect to make per day and the amount of space you have for your oven. Also keep in mind the type of pizza you are selling and which type of oven will bring out the distinctive flavors of your pizza to the fullest. Budget might also be a concern, but try not to skimp on your pizza oven, as that is the foundation of your pizza shop.